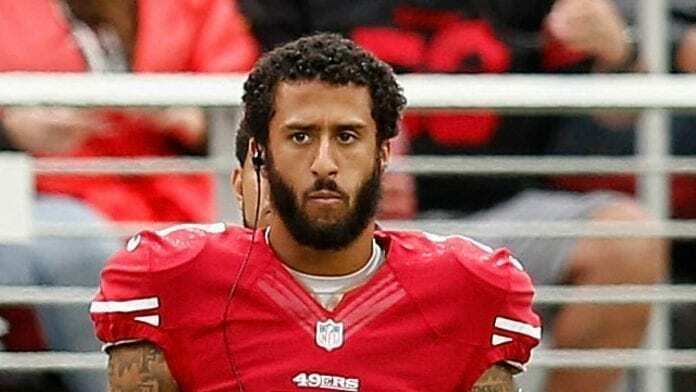 It has been well over a year now since Colin Kaepernick went from being an NFL free agent to a pariah. Over that time, he’s been the lightning rod for a protest campaign that has electrified many and angered others, while also triggering reaction from owners that’s ranged from bemused comments to threats about firings, and then the possibility being floated of insisting players stand for the anthem (which didn’t happen). Finally there’s been kind of an uneasy peace. The NFL owners did craft a conciliatory agreement with a select players’ committee pledging various amounts to charities, but even that became embroiled in controversy after some non-committee members accused select participants of being paid off to take the winds out of the protest campaign sails. Meanwhile, one team after another that needed backup QBs, even some with shots at the playoffs, refused to even bring Kaepernick in for an interview or a workout. But what has truly reawakened this issue is what is happening in free agency. In particular, the fact that 12 teams attended the recent workout of former Heisman Trophy winner Johnny Manziel, who by his own admission let drug and alcohol problems previously wash him out of the league. This is not to say any of these teams are going to sign Manziel, but they at least were willing to watch him in action. Some even acknowledged they were willing to interview him. The same is true of defensive tackle Ndamukong Suh, an undeniably talented but equally controversial player. During his time with first the Lions and later the Dolphins, Suh has repeatedly been accused of being among the dirtiest players in the NFL, and that’s ON the field. Off the field in both Detroit and Miami there were accusations and allegations that he was even harder to deal with in the locker room, and a consistent source of dissension. Yet he’s now being given the grand free agent treatment around the league, and even the Titans, a team that has publicly said it is reluctant to deal any more with any one remotely considered a problem, interviewed him. This week Suh signed a new deal with the LA Rams. Meanwhile, Kaepernick’s collusion case against the NFL is proceeding. He continues to maintain he wants to play, and is willing to workout for anyone who will give him a chance. There was an interesting article in USA Today (initially carried in the Tennessean) where a Titans beat writer acknowledged that Kaepernick was easily the best available backup QB in the league, but despite the Titans badly needing an experienced backup, the chances they had any interest in him were extremely low due to their fears about negative fan reaction. They opted this week for Blaine Gabbert. Teams continue to ignore Kaepernick months after he publicly said he was willing to forego any future protests, and wouldn’t be kneeling during the anthem if he were signed to a contract. But apparently the backlash, triggered in large part by President Trump’s comments, hasn’t subsided. A story that ran on ESPN’s The Undefeated website tracked the FIFTY (50) quarterbacks that have been signed by NFL teams since Kaepernick became a free agent last year. It’s a sorry list that includes some players who were previously retired, others who hadn’t been on an NFL roster for anywhere from 1-4 years, and some who hadn’t even played since graduating from college. The Dolphins plucked Jay Cutler out of the Fox broadcast booth rather than give Kaepernick even a shot at making their roster. By the way, in his final season two years ago, Kaepernick had 16 touchdown passes and four interceptions. Even if you concede he’s had perennial problems with downfield accuracy, it’s hard to believe that someone with that track record playing for what was then a woeful team (the 49ers of two years ago) couldn’t help some of the clubs in the NFL right now, either as a starter or a backup. Sadly, at this point, it doesn’t seem he’s going to get that chance unless a court forces the issue.